Throughout the year, we offer small group retreats with unique and interesting content for those seeking a deeper experience in a small group setting. You’ll want to sign up for our Email Updates or follow us on Facebook to find out when these retreats will be offered! WIP work in prog.ress (noun): an unfinished project that is still being added to or developed. Wouldn't it be great to sit and inventory your life, to look at your personal story...where you've been, where you are now, and where you are going next? Have you ever taken the time to explore you? What do you value? What is going well and what isn't going so well? Often it's family, culture, and friends who tell us who we are. Now you have the opportunity to really examine your own life and decide who you are and how you want to write the next chapters. The WIP Workshop for Women will be offered at various times throughout the year at Eagle Mountain Lodge outside of Eagle Nest, NM. The retreat starts on Thursday afternoon (5:00 pm) and concludes on Monday (12:00 pm). Cost is $650 (Includes a comfortable bed in one of our cabins, meals, and retreat materials). Reserve your spot today by clicking the Book Now, or email us at retreat@EagleMountainLodge.com. "I want a purposeful and fulfilling life, but mostly I find myself in a rut, frustrated and just plain uninspired. Even deeper, there is a gnawing fear that life is slipping away and I’m not having the impact I know I was made for. Introducing the High Camp Retreat where we will explore each man’s deepest desires and core values as he prepares to enter the last and most crucial Second Half of Life. Spend four days and three nights at Eagle Mountain Lodge in northern New Mexico with Life Coach and fellow journeyman, Marcom Herren. Come and join a small group of like-minded men who earnestly desire something more for their lives. With the beauty of the rugged outdoors and the cool, crisp mountain air, the clarity you've been seeking will come into view and you'll discovering the purpose and mission that has always been awaiting you! This vital and necessary Second Half of Life journey is calling you! Looking for PEACE*JOY*MIND & BODY AT REST*NEW AND FRESH EXPERIENCE OF GOD...invest in yourself, and come on retreat. WE INVITE YOU TO COME AWAY...TO BREATH, RELAX, AND ALLOW SPACE FOR YOUR SOUL! * No added fees or taxes. **Extra nights are available. Authors. Artists. Life/Executive Coaches. Teachers. And whatever else you can think of! 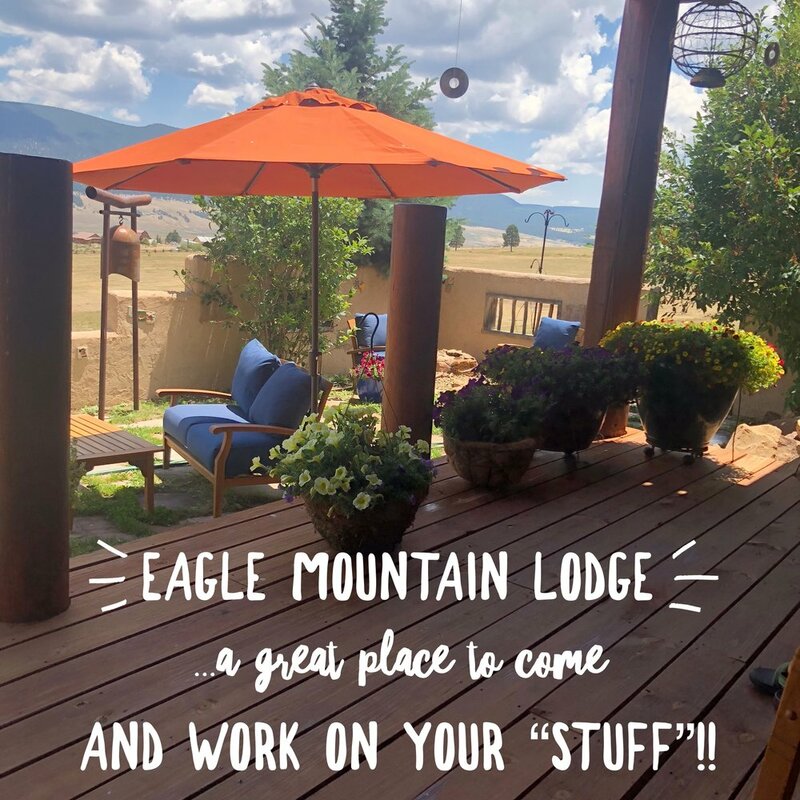 Eagle Mountain Lodge is an inspirational space to do your creative work. This is the place for you to create, complete and dream! Flat fees start at $75 per night. There is a multiple day discount.